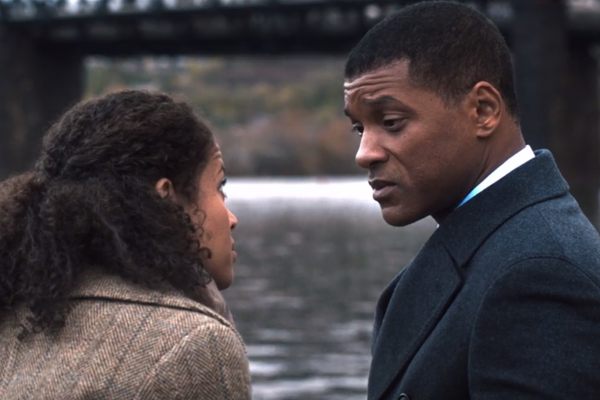 “God did not intend for us to play football,” so says Nigerian-born Dr. Bennet Omalu (played by Will Smith) in Concussion and there’s credence to that line even it (rightfully) slaps in the face one of the most American of national pastimes. Who’d have thunk it that perhaps a sport where athletes repeatedly lock heads with one another could eventually lead to serious brain trauma down the road? Filmmaker Peter Landesman’s tackle of head trauma and football is the subject of Concussion, an overly earnest but nonetheless well-meaning new film, which attempts to put the discoveries made by Dr. Omalu front and center. Early reports of the film suggested Concussion may sugarcoat the culpability of the NFL. To the credit of writer/director Landesman (and Sony too, who is distributing the film), those reports are fortunately unfounded. The film indeed does call this billions-earning organization to task in regards to head injuries on the gridiron. What’s unfortunate is that Concussion fails to fully stir, to become fully alive within its indignation. There’s a glint of agitation but the movie is never quite able to rise, to anger, to bother or provoke, or spark some sort of communal call to arms to get us all angry as hell to the point of not taking it anymore. 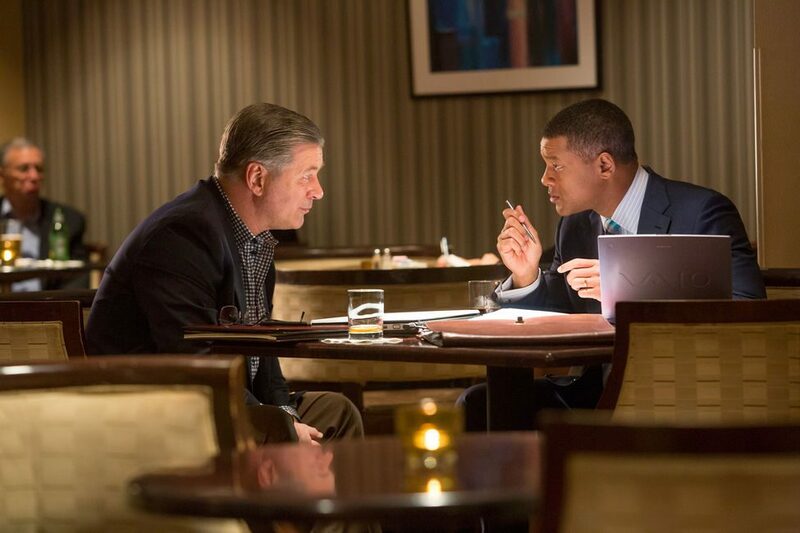 Which is unfortunate since Concussion really could have served as a stirring educational cue about the dangers of the sport while also bringing to the focal point the fascinating life and work of Dr. Omalu. Omalu could easily serve as a candidate for a more formal biopic treatment: he was born during Nigerian Civil War of the late 1960s and attended the University of Nigeria to study medicine at the age of sixteen. The movie pretty much glosses over his history- though the opening scene explains all the degrees and various honors Dr. Omalu has amassed, a way in part to let audiences know from the onset that he knows his trade. Concussion charts Dr. Omalu’s work as a forensic pathologist in Pittsburgh performing autopsies. Unique at his craft, Dr. Omalu speaks to the deceased on his table and uses a personalized set of specialized knives, something which seems to signify his outsider status. His latest patient seems to be a puzzler as former Pittsburgh Steelers hero Mike Webster (played by Robert Morse) arrives on his table. The film tracks Webster shortly before his death showcasing the former football great in a state of disarray- suffering from depression, mood swings and memory loss, yet the outset indicates a healthy man. Omalu’s intuition decides more tests need to be run and using money out of his own pocket, a startling discovery is found: neurologically Webster’s brain resembled that of a victim of Alzheimer’s disease. It clicks that repeated head traumas on the football field may be at fault (not so different as say severe head trauma cases that regularly impact boxers) and further findings lead Omalu to coin what is known as chronic traumatic encephalopathy (CTE). Similar cases arrive and Omalu- presented as an idealist and a football agnostic- seems to feel his findings will be greeted with open minds and a swift call to action especially for the National Football League. Omalu’s boss and champion, Dr. Cyril Wecht (an amusing Albert Brooks, continuing a solid recent trend of effectively hamming it up in otherwise serious movies; think A Most Violent Year and Drive) sees it differently: “The NFL owns a day of the week. The same day the Church used to own. Now it’s theirs.” He’s right, even as Omalu finds support in the unlikely form of Dr. Julian Bailes (Alec Baldwin), a former team doctor for the Pittsburgh Steelers. The NFL discredits, ignores and all but threatens Omalu’s work even as it becomes more and more damning. Luke Wilson even pops in for a blink-and-you’ve-missed-it near cameo as NFL Commissioner Roger Goodell giving lip service while essentially doing nothing. Which presents one the more problematic cases for Concussion as there’s startling little on the way of tension. Aside from a pesky phone call and a terse moment on the road with Omalu’s wife Prema (a wasted Gugu Mbatha-Raw), there’s little sense of actual danger afoot. The movie seems in part to want to channel the stride and spirit of fellow whistleblower flicks like the excellent 1999 film The Insider, Michael Mann’s avid indictment of the tobacco companies, yet doesn’t quite have the muscle or precision to back up its thesis. Landesman (who is also a journalist) further clutters the film with tangents that veer towards the melodramatic (especially in scenes showcasing the developing relationship between Omalu and Prema) that distract from Concussion‘s central argument. It’s a shame considering Spotlight just recently showed how thrilling and pulse-sweating a case study procedural can be. Smith brings an assured confidence to his performance- utilizing a terrific Nigerian accent that’s economic and unfussy- and uses his dynamic movie star charisma to a nice effect. Smith’s charm, however, sometimes works as a disadvantage to the film, sometimes nearly running off in the way of making some of the plot points inconsequential by his mere presence. 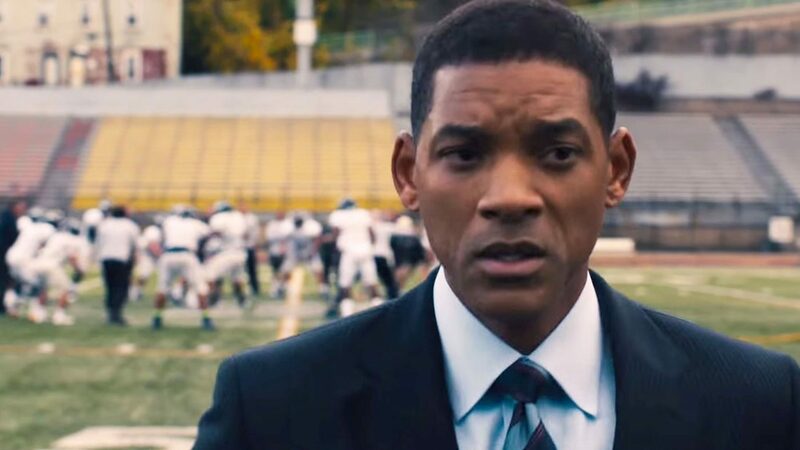 Here lies perhaps the ultimate dilemma for Concussion: is this a movie really more interested in taking on the NFL or is it merely a by-the-numbers biopic designed to show off the range of its movie star? The first path is noble and likely the more fascinating film; the second path has the stench of stodgy Oscar-bait at its most conventional. While not quite as soft on the NFL as had been rumored or feared, Concussion is still a strangely sleepy prestige drama. Writer/director Peter Landesman has a strong and valuable central story but ultimately loses focus of the end goal because his film can’t quite decide whether it’s supposed to be a muckraking polemic along the lines of something like Michael Mann’s The Insider or an old-school movie star vehicle tailored for leading man Will Smith. 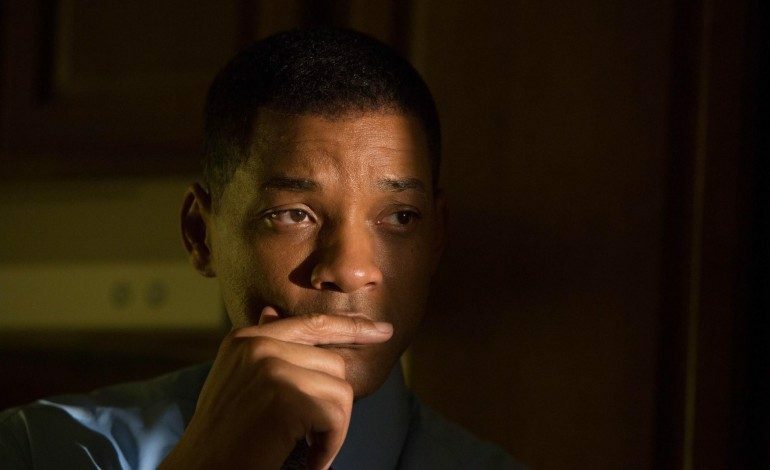 Concussion shouldn’t and can’t effectively function as both despite Smith’s endless charisma. Ultimately, the text- no matter how well-intentioned or vital- reads as sadly secondary. The target is set but the invective isn’t as forceful as it should be.